The atmosphere of the Lunar New Year in Munich is slightly less than in other European cities. However, my other half likes Chinese culture and enjoys Asian cuisine. We even post new Spring Festival couplets every year, so we can still feel the festive atmosphere of the New Year. Also, buying new year's goods at the Ingolstadt Village makes me looking forward to the New Year moment. Every year before the Lunar New Year, I am often invited by Ingolstadt Village or Wertheim Village to shoot a New Year album. Most of the previous years were based on fashion themes, but I wanted to try different content this year. The main reason is that I want to present issues that can create more interaction. It's not just for the social media, but also the communication between my family and me, the ordinary moments that make me cherish, such as travel, cooking, dining, music or movies. So I set the theme in home living and lifestyle. 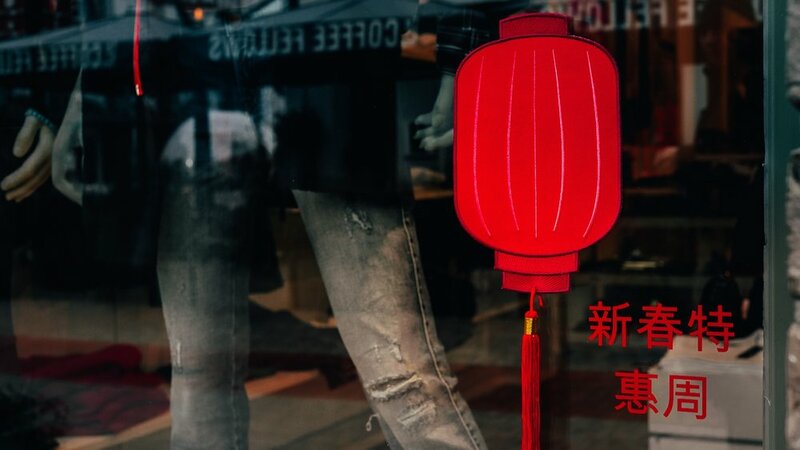 I focused on the five brands in the Ingolstadt Village : Le Creuset, Rosenthal, Type Hype, WMF and Zwilling, which are also the brands that we Chinese people like, and hope to present different shopping inspiration. When choosing products for shooting, I imagined that it was my shopping list. If it was for my own use, what do I want to buy? Is this price reasonable, practical? Sure enough, this list has become my wish list, and I look forward to the next time when I revisit Ingolstadt Village to collect them one after another. The Bicester Village Collection has two shopping villages in Germany, Ingolstadt Village in the outskirts of Munich and Wertheim Village in the outskirts of Frankfurt. Additional discounts sale offered in different seasons and special holidays. Because each offer always has a fixed period, I do not record in the article. However, before departure, you can use the website of the shopping villages to check the discount information. After arriving at the shopping villages, you shall go to the service center firstly to ask for the seasonal discount news. Chinese speaking staff is available in the service center and all stores in both Villages. It is very convenient for Chinese-speaking customers. Do not hesitate to ask for shopping and tax refund information. Little fine stuff for your quality life. And of course, a cup of nice coffee. 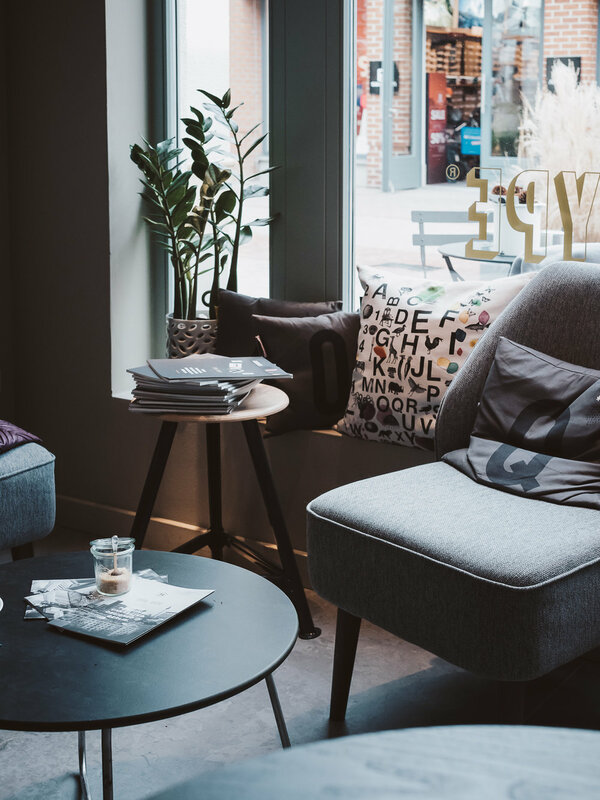 Type Hype from Berlin opened a store in Ingolstadt Village in the summer of 2018 to provide home living and lifestyle goods. The diverse and lively elements make itself unique in Munich. At the same time, Type Hype offers delicious coffee and pastries. The warm and well-designed atmosphere makes you want to enjoy a cup of coffee after shopping. Colorful kitchen and happy cooking mood. Le Creuset's pots were the ones I wanted to purchase in the Ingolstadt Village. I used to spend my budget on fashion items, but now I am more interested in home living. These changes are not overnight. I still appreciate fashion, but now I prefer to spend my budget on things that can create common topics and memories with my family. Cooking is the number one in life. I just mentioned with my other half that we reduced chances to dining outside in the past two years. Instead, we enjoy cooking at home. Cooking at home means eat better, more comfortable and convenient. It is also easier to match your favorite wine for different dishes. These are the reasons why I like to cook for my family and enjoy meals together. This time, I brought back two good pots from Le Creuset. While I was looking for proper pots in the store, I met a woman who came to Germany from Taiwan. Under the introduction of her experience, I found two pots that match my needs. It was difficult to carry two heavy pots home; however, I was so satisfied. 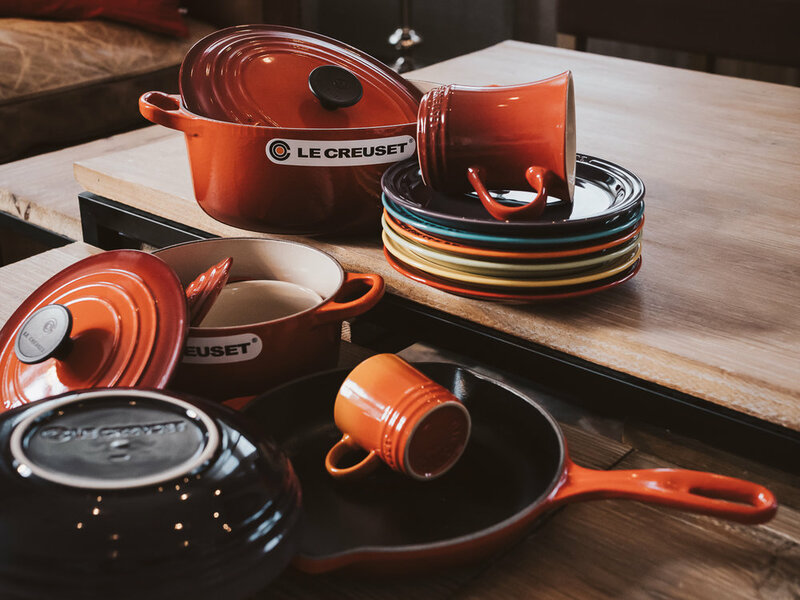 At the bottom of the article, there are two dishes cooked with Le Creuset. I was too excited, and I could not wait to cook with them right after I got home. Made in Germany seems to be a guarantee of quality. Zwilling's products are not only loved by users in other countries, but even the Germans are loyal users. In the Zwilling's store in the Ingolstadt Village, customers from Asia often take the product photos or model's number and ask the salesperson directly to get the goods. Local customers often compare the products that they already have at home and consider repurchasing different goods. The pots and the knife sets are of course popular items but don't miss out on beauty accessories such as nail clippers, tweezers and scissors. Pick a color and style that you like, because it will accompany you for a long time. The first home living brand I knew after I settled in Germany was Rosen Thal. The six-person porcelain set in the mother-in-law's house is Rosen Thal, which she bought nearly forty years ago. My mother-in-law said that although the price was high at that time, the quality is excellent. With her careful use, for almost forty years, the whole set of dishes is still served the best dining time when we return to our hometown. Today, the Rosen Thal company has different collections, and everyone can pick out the designs they like easily. However, I still love the simple style, like the style of my mother-in-law has. Therefore, I also bought a few plates, very satisfied. I used to buy a few beautiful cups and plates as accessories for photo shooting. But I didn’t dare to use it after taking photos. Until a few years ago, I had an interviewing with Leslie Sun, her words completely changed my mind: "The good things in life must be used to reveal its value." Yes, when I held the handmade cup that I bought during a trip to Amsterdam, the memories in my mind are priceless; if I only placed it in the cabinet, it would be a pity. I think WMF is one of the most popular "Made in Germany" brands. When my mother-in-law celebrated her birthday a few years ago, we bought a set of pots for her. She smiled and joked: It is such a good quality gift, maybe I will break earlier than this pot. Even my other half who doesn't know how to cook, he only advises me to buy WMF products because of quality. This time while I was in Ingolstadt Village, I received helpful information about the WMF products in the store, and of course the prices. 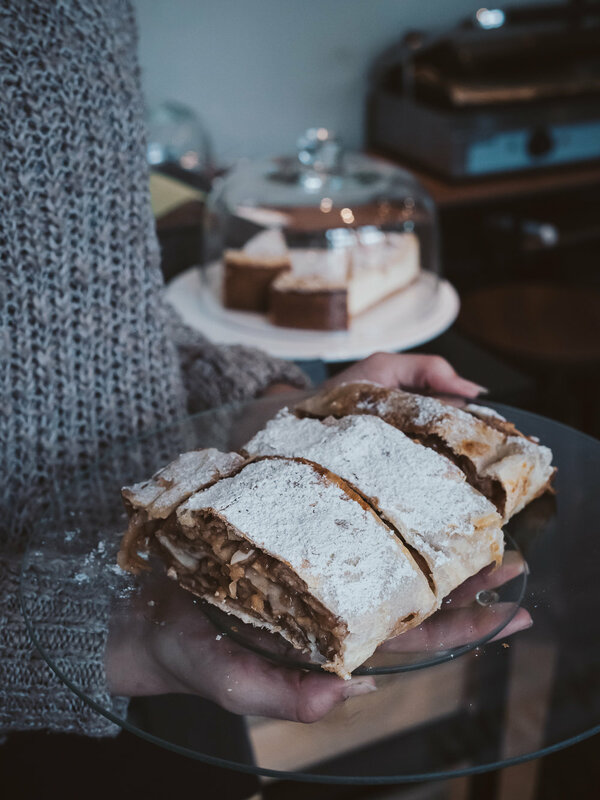 To my surprise, the prices offered in the village are worth to purchase every product on the "shopping list" without any budget pressure, such as Chinese wok, pressure pot or baking equipment. Every time before I visit the village, I first ask if my daughter who likes to bake needs any equipment so that I can bring it back by the way for her. Le Creuset's COCOTTE RONDE EN FONTE ÉMAILLÉE is definitely my first pick on the shopping list. The only question was which size I buy and which color would be better. Should I buy a bigger pot, or buy a smaller one that can be used every day, suitable for our lifestyle? Finally, the practicality wins, this 18cm-size black iron pot follows me home. The first dish I wanted to cook with this pot was Red Braised Pork. On this day, I got one beautiful piece of pork belly. I could image how soft it would be after stewing. In the past, I preferred to cook the red braised pork in a Taiwanese flavor. The thick and rich sauce dripped on the rice, so tasty. In recent years, I have become more and more fond of the seasoning way of Japanese-style braised pork. The refreshing taste has different layers. It is a delicious dish to warm your stomach in winter. The wooden plates and porcelain plates in the first two photos were purchased at Rosen Thal in Ingolstadt Village. 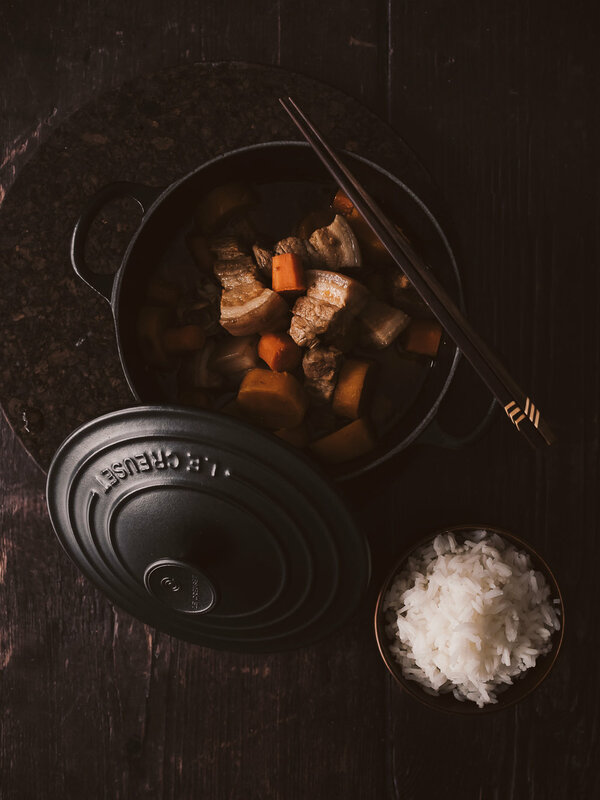 The heavyweight and warm feeling of the wooden dish make me feel happy and enjoyable every time I use it. When I was in Le Creuset, I met a Taiwanese woman. She seemed to have a lot of experience with Le Creuset pots, and we talked about it. Under her advice, I bought this MARMITE that is very suitable for our lifestyle. It can be used as a wok or as a stewing pot, and the size is also appropriate. Although it took a long time to get home with two heavy pots, I was delighted. When I got home and opened the box, my daughter saw the pot and immediately blurted out: what a beautiful pot; and at the same time ordering: "Mom, how about to cook a pot of chicken porridge, sounds good?" We had heavy snow in Munich in the past days, a pot of tasty chicken porridge is pleasant. In Taiwan, I would add ginseng. However, I don't have one here; instead, I added plenty of ginger. To stew chicken porridge with the Le Creuset thick and heavy iron pot is fast and good. It keeps the porridge warm until the end of the meal. This kind of simple life makes me cherish and satisfy. Invest your budget in life on things that can communicate with your family, create memories and topics, whether it's one pack of coffee beans, a movie, or a pot of chicken porridge that leads us to endless aftertastes. This post was written in cooperation with Ingolstadt Village & Wertheim Village for Le Creuset, Rosenthal, Type Hype, WMF and Zwilling. Even though, we give our own opinion uninfluenced. We had full rein over text and content of this article.